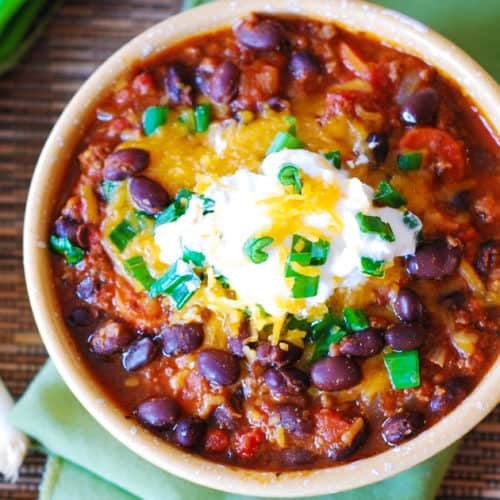 Black Bean Beef Chili Recipe – delicious, easy-to-make, cozy stew perfect for cold Fall and Winter days! Last week has been really busy for me, where my job combined with the fact that we had friends visiting and staying with us for several days created such a shortage of time, that I am extremely grateful that there exist easy dinner recipes, such as this ground beef chili recipe with black beans. While I was cooking all the time for our guests, starting at breakfast and ending with dinner, I unsurprisingly was able to capture none of the delicious recipes I made over the course of last week. Instead, I am presenting you with this simple bowl of beef chili and black beans, which is a perfect dish if you’re tired and out of energy (which is how I feel this week) and want something simple, comforting and delicious. 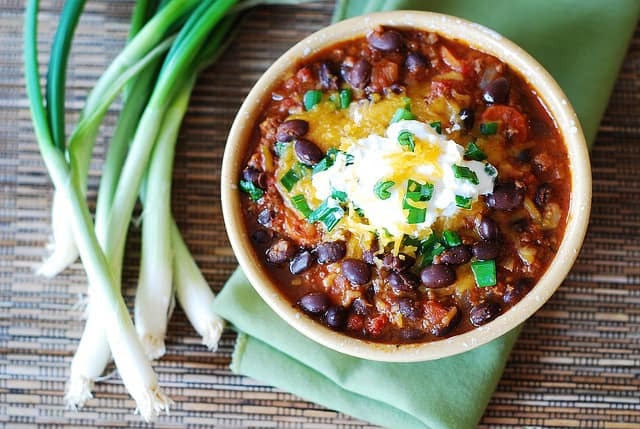 This chili recipe has a minimum of steps and zero complexity. Just throw ingredients in one pot, let it simmer, occasionally stirring, and you end up with a pure deliciousness. 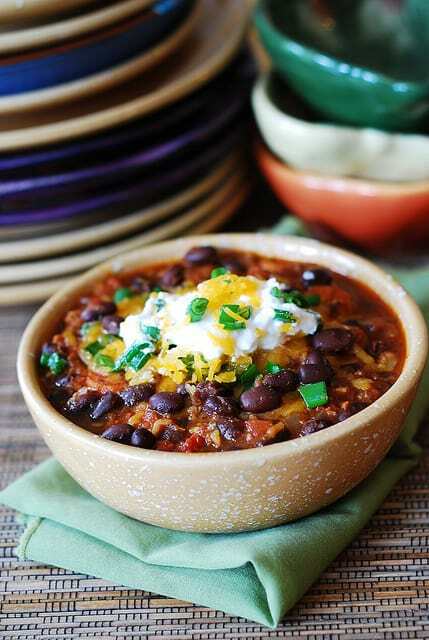 Easy recipe: ground beef chili recipe with black beans. Perfect for cold Fall and Winter days. Heat vegetable oil in a large skillet, add ground beef and cook until browned and all juices came out on medium heat covered – about 10-15 minutes. Drain from grease and juices. In a large pan, heat olive oil on medium heat, add onions and garlic, cook for about 3 minutes, add carrot and continue cooking for 2 more minutes, stirring. Add cumin, paprika, chili powder, Italian seasoning to the onion mixture and continue cooking, stirring, to mix everything well. Add cooked and drained ground beef from step 1. Add canned tomatoes with juices, slicing tomatoes into small chunks before adding. Add beef broth. Bring mixture to boil and cook covered on low heat, simmering, for 1 hour. After 1 hour, add black beans, salt and continue cooking for 20 more minutes, covered. To serve, top with grated cheddar cheese, chopped green onions and sour cream. Do you drain/rinse the black beans??? I love this chili. I searched the Internet for healthier options and found yours. According to myfitnesspal yours totals 208 calories per serving! Without the sour cream and cheese of course. Still with out this recipe tastes amazing. Even my liked it and she is not a chili fan.